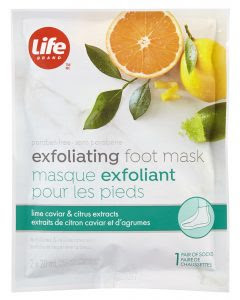 Life Brand Exfoliating Foot Mask - 1 pair - $5 - with AHA, salicylic acid lime caviar and citrus extracts to help remove dead skin cells, revealing a new layer of skin for improved texture along with peppermint oil and sugar cane to revitalize - leaving feet soft, revitalized and refreshed. If you haven't yet had the disgusting fun of them, they're easy to use: just slip on the plastic socks, add the liquid packet and chill for 15-20 minutes, then remove socks and rinse feet well with lukewarm water. Approximately 3-7 days after use your feet will start to peel and can continue for 3-5 days - the hardest part will be resisting the urge to pull at the dead skin yourself - you are supposed to let it naturally fall off! My best tips - put a pair of cotton socks over the plastic booties to keep them snugly on, the adhesive strips don't do a great job and don't moisturize your feet during the peeling phase - you don't want anything to interfere with the exfoliating! I am dying to get my hands on this and couldn't find it at any Shoppers Drug Mart in Toronto. I'm so sad.